We present our fourth solo exhibition of paintings by Portland-based Stoddard-Hayes. Notably, each of her paintings begin with the application of fungi (from her garden) directly onto the surface, leaving imagery that guides the composition. Brassworks Gallery presents a 14 artist habitat of Animalgamation. We are celebrating the animal kingdom this month, so if it walks, crawls, flies or burrows our artists will include them in our amalgamation of creatures. 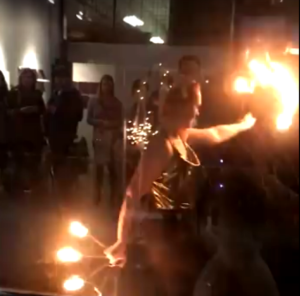 In addition to a all new works by resident artists, including two new artists, East Creative Collective is excited to announce our May opening will feature live fire dancing by Isabel Platten of Photonica. Join us for a night of art, food, wine, and flame! 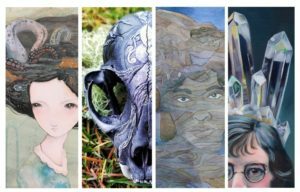 Be sure to check out their opening this month, featuring work by 11 artists and live music by Josie Lisette. 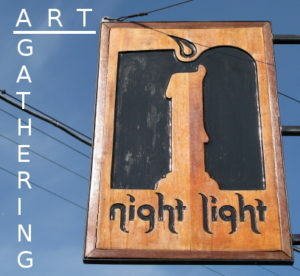 The First Friday PDX Team is excited to invite you to an evening of collective community creation at one of SE Portland’s up and coming art spaces and hang out spots—Night Light Lounge. We bring together a diverse group of art entrepreneurs and visionary ideas. Meet your artistic neighbors. Share your accomplishments and goals. Find ways to support each other. Casual networking and elevating conversation will ensue. There is a reserved area for this event. Arrive early for happy hour pricing before 6! The First Friday PDX Team hosts the Community Gathering quarterly to connect artists with art spaces, create/discuss SE area art events and to have a little fun!! This opportunity to interface with the First Friday PDX team directly influences the direction of the organization and the greater SE art community. All are welcome. Costumes, cats and bikes OH MY! 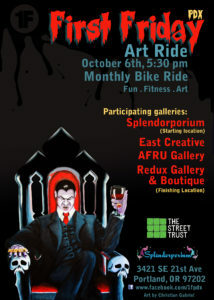 First Friday PDX – Portland’s Eastside Artwalk and The Street Trust– Women Bike invite you to join us on a Night of the Living Dead Artist Art Ride. Ride participants are encouraged to come dressed as a dead artist. The event will take place on Friday, Oct. 6, 2017 at 5:30 p.m. 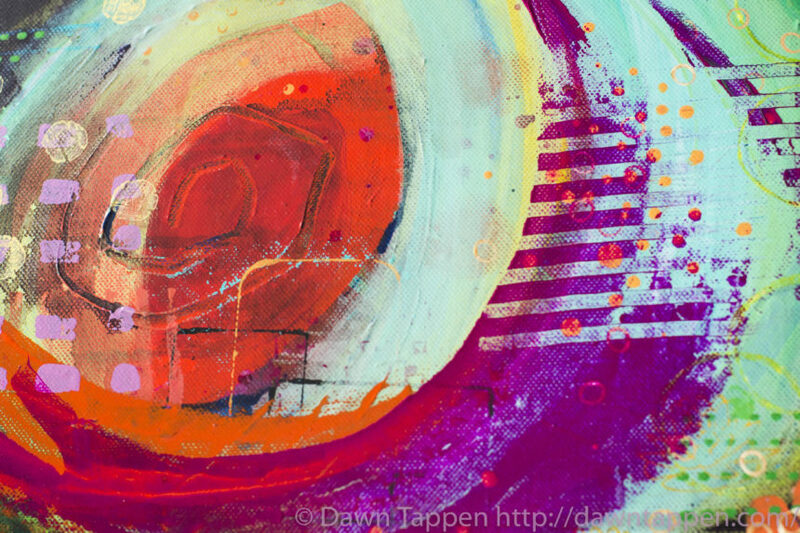 The first gallery and meeting location will be at Splendorporium, 3421 SE 21st Ave., Portland, OR 97202. The ride will commence from the starting location at 6:00 p.m. Participating locations include: Splendorporium, East Creative Collective, AFRU Gallery and Redux Gallery and Boutique. Artists and galleries looking to promote an upcoming art event opening on First Friday can be assisted using a few simple social media tips. In order to bring a larger audience to your space and generate more awareness of your creativity and news a consistent approach to social media and forming alliances in the community are needed. First Friday PDX uses Facebook, Twitter, Meetup and soon we will add Instagram. If you connect with us, we can be on the lookout when you post news, events and updates. Check out our gallery and artist page to see other businesses in the community from which social media alliances can be formed. 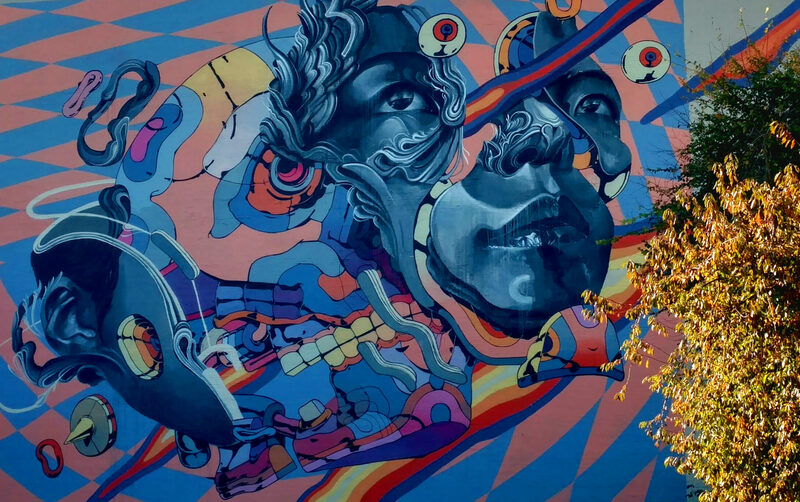 On your website, blog, newsletter or other social media announce that you are a part of First Friday PDX and link to our website or Facebook page. Once you plan on opening for First Friday on a recurring basis we recommend repeating this kind of post at least a few times a month because repetition tends to draw more visitors to your posts and over time this will create a buzz! Use Google to search for instructions on how to tag and share using social media platforms. Below we have listed instructions for Facebook. Use your Facebook page to create an event with your contact information (include your address and First Friday open hours.) This provides our First Friday PDX page with a link to promote you. Along with the show opening details, add a short description to the event about what you are currently working on and a brief bio/about you section. Share this event with your friends, family and fellow artists. When you write a post or create an event description type our page like this: @First Friday PDX. Our name name will now show up as a blue link to our page in the message and the entire message will show up on our page’s WALL and be visible to all of our fans. Don’t forget to use our hashtags #firstfridaypdx #1Fpdx in the keyword area along with any other relevant keywords. This will allow us to easily share your event from one location using additional page tools. 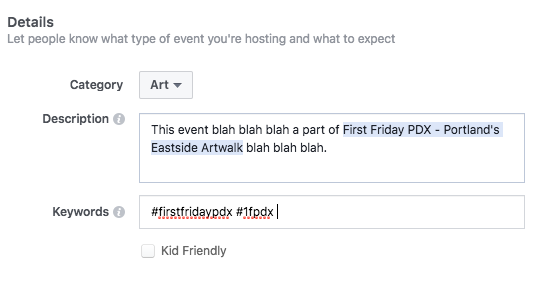 When creating your event make First Friday PDX a co-host and it will automatically add your event to our featured events AND post the event to our main newsfeed. 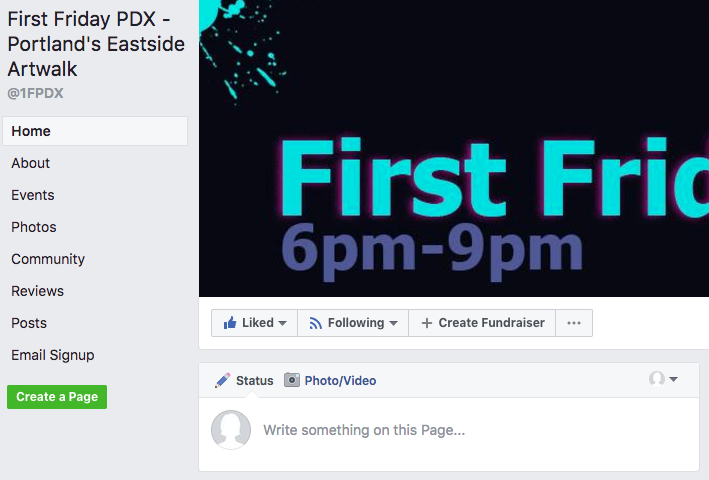 Another way to promote is to share your event as a post to the First Friday PDX page and we can share your event to our main feed. We write a press release about First Friday happenings and submit it to many local press outlets on a monthly basis. Our press deadline is the 17th of each month. 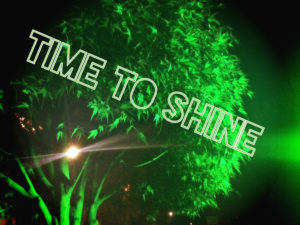 Most of the time we can include your event or news update if submitted in time. If you plan on participating in First Friday on a recurring basis we can announce you as a newcomer on our social media outlets. 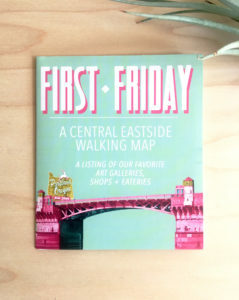 The best way to submit your information is to email us with your photos and press releases and be sure to add our press email press@firstfridaypdx.org to your mailing list . 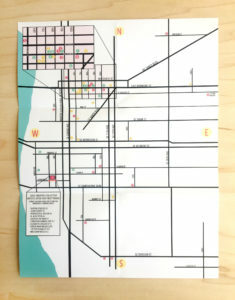 Tamara from Redux has published a printed map to First Friday galleries and her favorite local spots. The map is free to First Friday PDX attendees. Local businesses can pick up maps for sale in bulk at her shop located @ 811 E. Burnside #116, Portland, Ore. 97214. Shop hours are Monday through Saturday 11 a.m. to 7 p.m. and Sunday 11 a.m. to 5 p.m. The prices below reflect the cost of creation. $10 for 25, $18 for 50, $26 for 75, $35 for 100, and 35 cents each for more than 100. Introducing – the Art Ride! 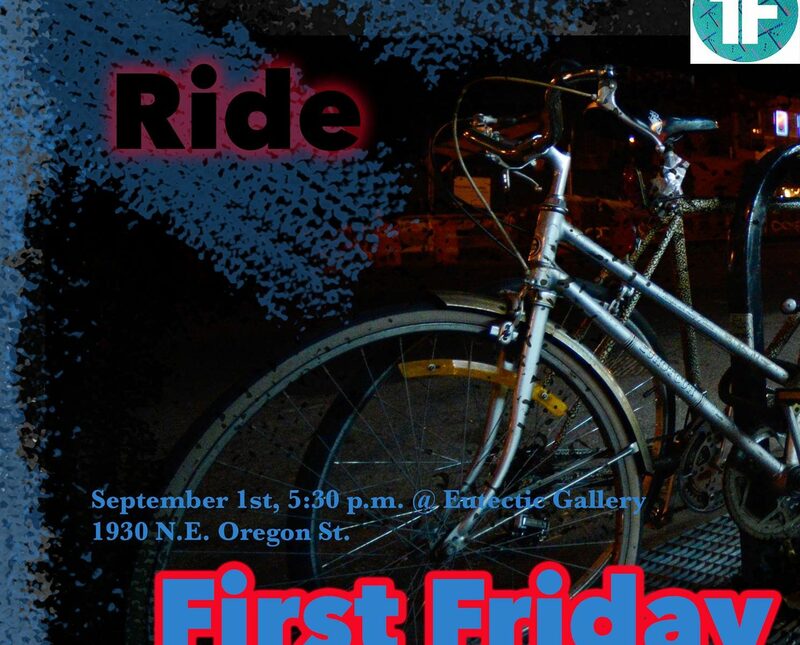 First Friday- Portland’s Eastside Artwalk and The Street Trust invite you to join us on an Art Ride as part of Women’s Bike Month! The bike ride will visit six galleries located in Southeast Portland. The event will take place on Friday, Sept. 1, 2017 at 5:30 p.m. The first gallery and meeting location will be at Eutectic Gallery, 1930 NE Oregon St. Portland, Oregon 97232 (entrance located on 20th).